The problem with cameras is that they’re getting to be more like computers. The problem with me is my Palovian response to any shiny object with a chip in it. The problem with the guys is that they see my shiny toys and want to play with them. The problem with my camera bag is the serious case of airport shoulder that comes from carrying it. I blame it all on deployment. If Dad can’t be here, he has to have visual evidence of karate belts, baseball games and school concerts. Concerts? Photos don’t do those justice. You need video, and at least two cameras. One for me, and one so the guys will keep their grabby little hands off mine. Life was simple for years, when it was just my Montgomery Wards Vivitar, two lenses, a flash and me. I never used the longer lens – the only reason I had it was because it came with a kit that was $200 on clearance. Two hundred bucks was a chunk of change back in the day when I was making $250 a week. It’s barely a start these days. Then came kids, digitals and impatience. Why wait a week for film when you can have instant gratification? Why mess with transferring High 8 footage to cassette when you can do it digitally? I upgraded my camcorder when Big Guy was a baby and my still shortly after Boots was born. That should last me through at least junior high, I thought. Bwaaaa ha ha ha ha. The computers are partly at fault for the newest camcorder. The old one uploads by firewire, and we have only one computer left in the house that will handle that. The upgrade has nothing to do with the fact that the new model will record in high definition, with the same aspect ratio as modern TVs. That’s just bonus points. I’m sure Dad will appreciate the HD difference as he views DVDs on his laptop. The problem is, I have several video projects I’ve started for Dad on the old camcorder so I’m currently toting both. Plus the Flip camera that’s largely been relegated to the guys. Boots thinks he’s taking stills - I have a lot of two-second video. Big Guy thinks you swing the camera wildly in the same frenzied motions you make – I have lots of shots of boogers. Then there are the cameras the Easter Bunny bought the guys. Plus my old digital point-and-shoot that I still use if I can’t get to the EOS Rebel I bought myself for my birthday quickly enough. So what’s in my camera bag? 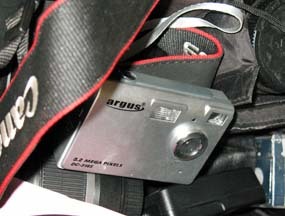 One EOS Rebel with three lenses, a flash and extra batteries, assorted filters and a backup battery. An older Canon camcorder with two lenses and eight tapes because I never know when I’ll need to record nine hours of footage. Two el cheapo point and shoots. A new Canon camcorder with an extra lens, filters and a backup battery. A Flip camera with a backup battery. An Olympus digital voice recorder because the wind around here destroys natural sound. Yes, it has extra batteries, too. An untold number of memory cards, because I never know when I’ll need to record nine hours of footage. It’s a good thing Dad’s bringing in extra money while he’s deployed. I think I’ll need it for chiropractor bills.